There are so many different carp rigs available on the market today but the real question is, what type of rigs are best for catching more carp? A few carp anglers believe they have discovered the best carp rig simply because they've caught a number of carp on it over the past months or years. However, it doesn't necessarily mean that a specific rig is great just because it caught some carp, there are numerous factors that can affect a rig's success. Also, there may be another carp rig that could work much more effectively for each separate fishing situation. In fact, a great rig may become useless if it lands in a bad way, such as a part of the hook link looped up off the bottom in any way that reveals its presence, or if the hook point has picked up some debris. Yes, you may have used foam during casting but, a carp spitting out the rig without your knowledge or the movement of carp in the area could cause these problems. It's also possible that very poor rigs can sometimes work in the right conditions. For example, if the rig has landed in a beneficial way on the bottom, or it has landed in a way that helps disguise it or blend into the lake bed. This alone could be enough to trick many carp into picking up the bait, eventually the hook point will penetrate a carp. Another way poor carp fishing rigs could still work is if there are many carp feeding at the same time. The competition can make carp lower their guard as they attempt to pick up a bait before another fish gets to it. This alone can make your fishing session a dream, even if using below par rigs! There is a lot more to catching carp than just selecting a great rig however, I believe the best carp rig to use will change with each fishing venue, and will depend on many factors; colour of water, type of lake bed, weather conditions, feeding habits of carp, the strain of the majority of carp within the lake, the number of fish feeding, etc. There will be no specific situation where one rig will be best to use for any lake, as well as at any time of year. For most of us it will be a process of trial and error during a fishing session, only learning from experience will pay off in heaps. The best rig in the world cannot possibly work if there are no carp in the swim. Location is probably 90% of the battle! The best rig in the world cannot work if the hook point has caught up on debris. The greatest carp rig in the world wont catch carp if they're just not feeding! A great rig may not work well if it has not landed properly on the lake bed. A great rig can still fail to catch if carp associate your chosen hook bait with danger. A fish must pick up your bait for the rig to work! The best rig cannot work if it is not geared towards the way the majority of carp in the lake feed, in other words, the strain of the carp and the way they feed. 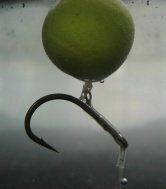 The best carp rig may not work if the materials used cause the hook bait to act in an unnatural way, it may spook carp. The best rig in the world wont work if the hook bait cannot be found, through smell or sight. Always use good quality bait and never overdo it on the smells unless it's part of your tactic! The best carp rig may still not be effective if the materials used can be seen, always camouflage end tackle. The best rig may still not work if carp become spooked by other bad habits or tactics associated with your fishing. As an example, being too noisy. The most important point to remember is a good carp rig can never remain effective on the same lake, through constant use carp will eventually adapt and wise up to it! Even if you’re using a rig that is producing great results, at some stage during the fishing session there may be a need to change the rig and adapt to changes in the lake or carp feeding habits. Try to get into a experiment & test habit when carp fishing. Trying new ideas will always make you learn something new about carp! Fake Hemp Carp Rig & Hemp Carp Fishing Rigs in PVA Bags! Hemp Carp Fishing Rigs in PVA Bags! Many More Fishing Rigs Listed on this site!